Did you know the purpose of a bumper is to absorb impact damage from a minor collision? You could say that damage to the bumper is then expected. However, vehicles are no longer just a means of transport, they’re a fashion accessory as well and let’s face it, no one intentionally dresses up to look bad, so why should your vehicle let you down? A recent study on statista showed that in 2017 there were 31.2 million licensed cars across Great Britain and 2.6 million licensed cars in London alone. That’s not including motorcycles, lorries, buses, agricultural or cyclists. With that amount of traffic on our roads, you can see how it’s almost inevitable that at some point or another, you may be involved in a motoring accident, however small it may be. If you’re a car owner living in London, I would be surprised to hear if you’ve never noticed a scuff or a scrape on your bumper. In fact, we get a lot of new vehicles that have barely been on the road for a year and already the owners have noticed paint damage. Whether it’s a scratch or a crack, whether it happened whilst driving or parked up, we can offer a repair service that will restore the vehicle to its pre-accident condition. Do You Only Repair Plastic Bumpers? Rigid metal bumpers can be very difficult to repair in comparison to a flexible plastic bumper. In fact, it can quite often be faster and cheaper to replace a metal bumper than it would be to repair. On the metal panel, we would have to get a perfect ‘metal-finish’ with no fillers used and then send it for chroming, which can very quickly mount the costs up more than what a replacement would be. Plastic bumper repairs are a lot easier and in most cases, it would work out a lot cheaper than having to replace the complete panel. We have a great team of specialists and only use high-quality plastic fillers where necessary to ensure that every professionally repaired bumper is finished to the highest standards. What About Plastic Bumper Repair Kits? 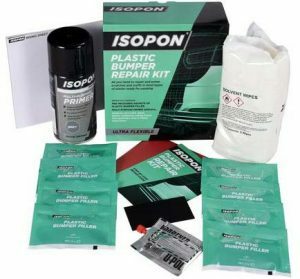 Repair kits are quite popular amongst DIYers for all types of jobs and often they do provide great value for money but you should always know when something requires a bit more of a professional touch. Using a repair kit for cosmetic damage and smart repairs is fine and in fact, we’ve done an extensive write up on how to repair a plastic bumper using a DIY repair kit. For cracked bumpers, we would never recommend a DIY repair kit. Some of them will come with additional glues and resins but if you’re after a professional repair, it should be stitched and plastic welded to restore the strength to the panel and that’s something that just doesn’t come in DIY form. What About Mobile Bumper Repairs? Mobile repairs seem to be the latest craze and that’s not to say it’s a new solution, mobile repairers have been around for many years and are becoming increasingly popular. We’ve heard some real horror stories and often, it’s due to lack of experience and training. Don’t get me wrong, they’re not all bad and some of them are really good at what they do. We’ve seen before & afters on bumper scratch repairs that were carried out by mobile repairers and the finish was pretty good but we’ve got a keen eye for detail and it’s never perfect. If it were, we would all have set up tents for painting in our body shops and not invested £50k+ on low-bake spray ovens. What Does a Bumper Repair Cost? 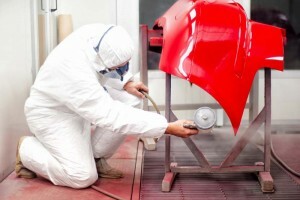 When calculating the cost of car body repairs, there are a number of factors which need to be considered. When a car comes in for a bumper repair, we inspect the visible damage but also, we must look at the possibility of any underlying damage. We’ve often had customers tell us ‘but it’s just a little scrape’ and not realising that their parking assist system has stopped working due to an electrical malfunction following the collision. That’s not to say it will become an expensive repair. In a majority of the cases we’ve seen, if the park assist or parking distance control system (PDC) stops working, a simple reset normally brings it back online. So how much does a bumper repair cost? Well, how long is a piece of string? Really, we need to see the vehicle to inspect the damage and compile the repair estimate. If you’re unable to make an appointment to come in and see us, use our online contact form and attach images of the affected panels. Our expert vehicle assessors will inspect the images and compile an estimate report for you based on the images provided. In 9/10 cases, there is no price increase in the estimate given online. Do You Offer Bumper Repairs Near Me? We’re based in Greenwich, South-East London. If you’re local, feel free to call us and book an appointment with one of our vehicle assessors. We can usually offer a same-day assessment. If you’re not local, it’s not a problem! Jump online and send us an email with images of the damage and see what we can do for you. We have customers coming from as far as Slough & Heathrow for car bumper resprays, so we must be doing something right! We’ve sent you an email requesting images of the damage. If you can respond to our email with a few images so that we can see the damage to the bumper, we can then quote you accordingly for the repairs. Can i send you a photo of it to see if you can fix it? Sure please fill in the contact form on the right and click on “Choose File” to upload an image of the damage. If you have more than 1 image, press the “+” symbol to upload additional images. I hope this helps. Hi my f/bumper has a hole about fist size plus some marks on pass/side I have the bits from damage. Its a mondeo in pantherblack. What do you think?. Sorry this landed in our spam folder but the issue has now resolved so won’t happen again. We’ve sent you an email with some information if you still require our services. We’ll need some images to confirm the cost as it can vary depending on various factors. We have sent you an email with some guide pricing and information, if you could respond to the email with images of the bumper that would be great.